Forty years ago, on June 15, 1978, my friend Ray Jim John called me and said that he had just bought a copy of Bob Dylan’s new album Street Legal. Since he had copied it onto a blank cassette for playing in his car, we decided to drive somewhere and listen to it. We picked up two of our friends and took a trip on country roads in California’s Central Valley that wound up dead-ended on a dirt trail, facing a field of corn, a long way from Lincoln County Road or Armageddon. Q: How did this project begin? A: At some point during an ongoing e-mail thread with some of my closest friends, I mentioned the cover of Dylan’s song “New Pony” from Street Legal by Maria McKee and how I wished that her band Lone Justice would have covered the entire album. One of my friends suggested that I might want to try doing it. I thought it was a good idea and here we are now with my version of the album. Q: What makes your version different from the original? A: The instrumentation, for starters. Instead of following Dylan’s twelve-member band approach or McKee’s electric rock sound, I decided to dress up the songs in Blood on the Tracks clothing. A: Acoustic instruments and an intimate feel for the songs. Putting the focus on the lyrics and how they’re sung, instead of a BIG sound. I love the big sound of the original but I thought giving the songs some air was a good idea, too. Q: What else is different? A: The song sequence, the arrangements, the instrumental solos. I tried to root the album in the sense of a finished relationship between two people, its finality and everything that comes with it, and also the unknown aspect of what happens next. Dylan’s sequencing tended to hopscotch between emotional states – there’s a certain advantage to that approach, in the sense that the listener has to bring more to the experience of absorbing the album as a whole. My approach was more arc-based. Point A to Point B without knowing where/why/what Point B meant. Initially, anyway. I have a better idea now. A: Oh, I couldn’t REALLY tell you. True love tends to forget. Q: What did you play on this recording? A: I played six- and twelve-string guitars, slide guitar, bass, banjo, mandolin, harmonicas, organ, congas, udu, sleigh bells, egg shakers, jaws harp, a tamboura app, and sang the lead vocals and harmonies. The original version also had me playing plastic bucket drum with a garden trowel handle – I wanted a big THWACK sound on two of the songs – and udu on another one but I decided that those songs would be better served with a full drum kit. Jason Peri was mixing the songs, I asked him to add drum tracks on those three songs. I loved the results. In keeping with the Blood on the Tracks approach, it’s similar to Dylan recording the album in New York, then redoing some songs in Minnesota. It wasn’t my intention to “do it like Bob,” things just happened that way. Q: Where did you record the album? A: I did my parts at my home studio in Vallejo, CA. Jason added the drums and did the mixing and mastering at his studio in Diamond Bar, CA. I should point out here that his work is a HUGE part in why this recording sounds like it does and that I’m eternally grateful. Q: Did you do anything special regarding the recording process? A: I recorded everything at night. Dylan’s album is one of those soundtracks to the moments when one wakes up during the middle of the night and thinks about things that aren’t faced during the daylight. I figured it was best to use the nighttime mojo for these songs. Q: Are there any outtakes from your album? A: None. I did use an outtake from the original, though, the song “Walk Out in the Rain,” which Dylan wrote with Helena Springs. Actually, I only used the middle verse. Eric Clapton recorded the entire song on his Backless album, which came out around the same time as Street Legal. A: It ties up the first half of the album. My approach was to think of the album as Side One and Side Two, sequence the songs accordingly, and end each “side” with a short song. Kind of like what Neil Young did on his After the Gold Rush album. Q: Is that your favorite Neil Young album? A: It’s Jason’s. I’m a Zuma guy. Q: What about the cover art? A: The front cover is supposed to suggest a road with broken yellow lines on it. Or a broken wedding band surrounded by darkness. 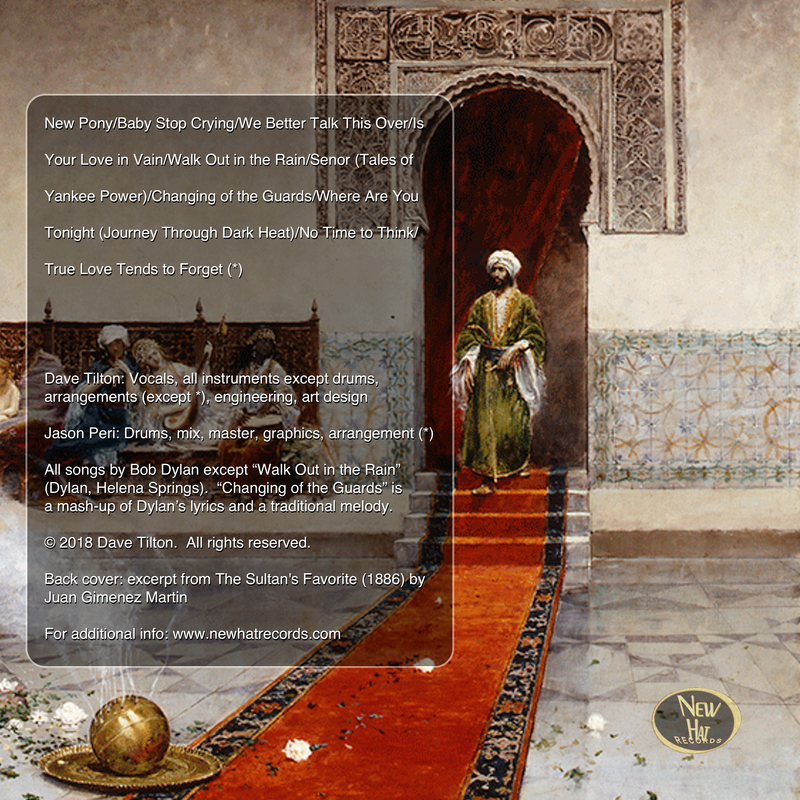 The back cover is from a 19th Century painting titled “The Sultan’s Favorite” by Juan Gimenez y Martin. It echoes the shot of Dylan in the stairwell from the Street Legal front cover and is also a bit of a clapback to a comment from the Greil Marcus review of Street Legal in Rolling Stone. A: Look it up. Marcus didn’t seem to like it much. In fact, Rolling Stone published a second review of Street Legal, more favorable than the Marcus version. I don’t think the second one really swayed too many opinions, though. It’s still considered Dylan’s “Elvis album” or “Neil Diamond album” by most people, and not in a good way, if they’ve even bothered to listen to it. Q: Why do you think so? A: I think part of it is the photo on the back cover of the album – the shot of Dylan in a white puffy-sleeved jumpsuit. A lot of the criticism from 1978 made a point to mention that image and referred to the subsequent concerts as Dylan’s “Vegas tour.” I also think part of the problem was the use of the women singers. To me, they added a gospel flavor to the songs, like what Ray Charlesdid with the Raelettes. In retrospect, it’s an unintentional clue for what was coming next with the Slow Train Coming music, which has been critically reevaluated lately, even getting a multi-disc live release of that period’s music on Columbia Records. Q: Is your intention to be a catalyst for reevaluation of Street Legal? A: Isis Magazine published an article a few years ago regarding the relationship between the Street Legal songs and Robert Johnson’s music. I think it was a much better catalyst than anything I could do. I also think that time has a way of revealing things that were not so apparent at first glance. Or first listen. Q: One of the songs is titled “No Time to Think.” Do you agree with that premise? Q: What strikes you the most about these songs? A: They’re timeless. Anytime two people end a relationship, there are going to be moments of anger, disillusionment, depression, sadness, and apprehension for each of them. The narrative voice in these songs is not always the person that one would want to take home to meet the family. In fact, the final song’s narrative voice – voices, I should say – is fragmented and all over the place. There’s no indication that the narrator is going to get back on track. Q: Or catch the slow train coming? Q: You’re a fan of the original album? A: Absolutely. I think it was radically different than its predecessors – Blood on the Tracks and Desire – which may have turned off part of his audience. Part of my reason to use an acoustic format was to see what the songs might have sounded like had he continued with his mid-1970s sonic approach. Although, really, that’s not what Dylan does, you know. He changes. 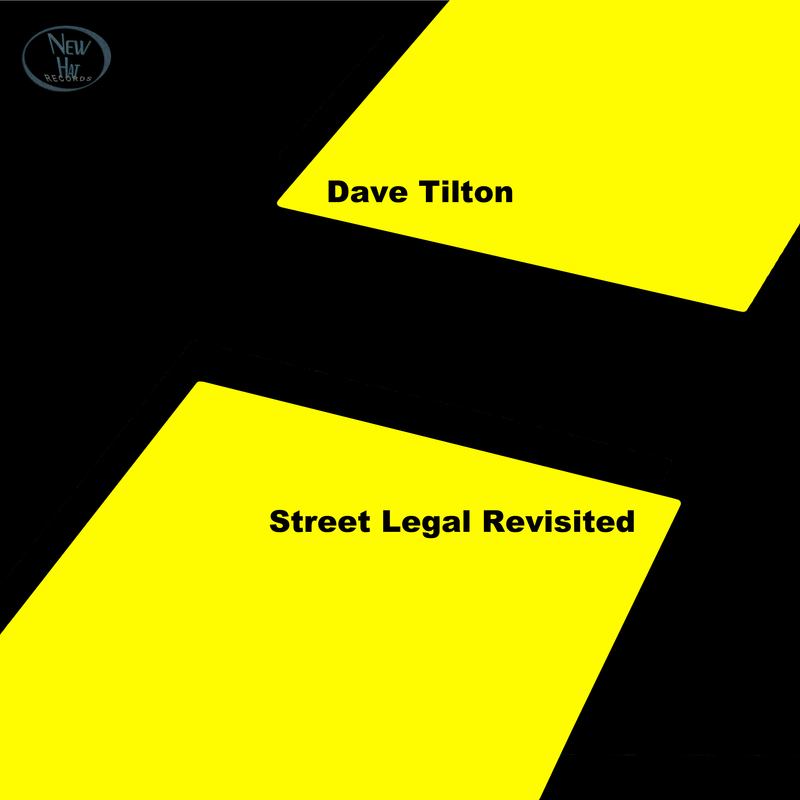 Q: Did you title your recording Street Legal Revisited as a tie-in to Highway 61 Revisited? A: Well, as a pun, of course, but it has nothing in common with that album other than its creator. Street Legal has been around for forty years. I thought it was time to take another look at it, especially after my friend’s suggestion to do so. He’s mentioned in one of the songs, too. A: Ray Jim John. It rhymes with “St. John” from a line in “Where Are You Tonight” and I thought it would be a nice way to get him into the mix, so I changed the lyric to have his name in it. A: No more cover albums! I think once was enough. I’m busy working on new original songs for the next Seventh Triangle album with Jason, which should be out in 2019. Maybe in 2059 someone will do an all-acoustic version of it. We’ll see – well, I won’t. I’ll be long gone. Q: So are these questions really “frequently asked”? A: I’ve been asking them and others for decades. Q: What’s THE most frequently asked? A: How does it feel? Copyright 2018, Dave Tilton. All Rights Reserved.